Eau Claire North’s Joey Koller battles Eau Claire Memorial’s Easton Tok (8) for the puck in intracity boys hockey play on Jan. 3 at Hobbs Ice Center. Eau Claire North's Joey Koller looks for an open spot to shoot during the WIAA sectional final boys hockey game against Hayward at Hobbs Ice Arena on Saturday. 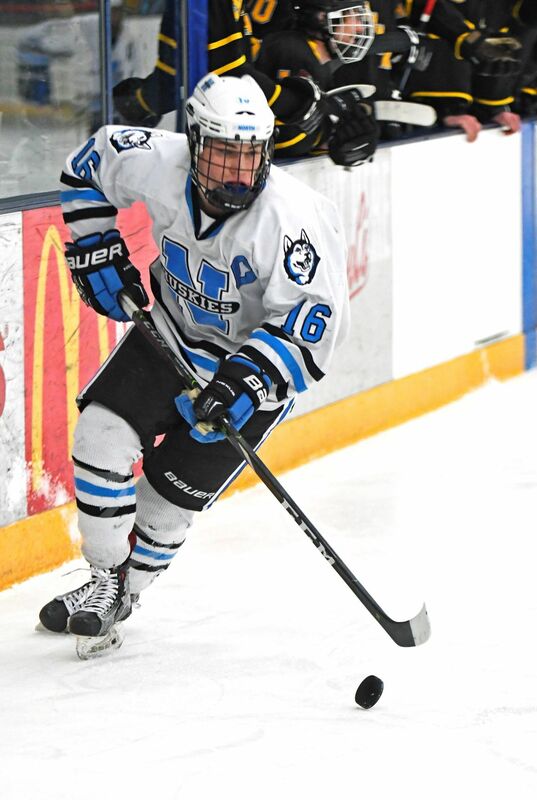 Sam Stange and Zach Urdahl get most of the attention in any Eau Claire North hockey scouting report, and rightfully so. The duo finished first and second in the Big Rivers in points, respectively, and are a big reason the team will play in the state tournament on Thursday for the first time since 2006. But don’t forget about the third member of the Huskies’ top line, Joey Koller, who has served as an excellent facilitator since the trio were cemented together midway through the season. “As cliche as it is, I think he’s kind of the glue to our line,” Stange said Tuesday afternoon at Hobbs Ice Center. “When it’s us three out there, we’re just all working together. He keeps up with us, he makes plays. He’s the first forechecker sometimes. Basically whatever we need, he’s a guy that can always do it. Koller, a junior, led the team with 37 assists in the regular season and scored 13 times, the only Husky outside of the big two to hit double digits. In the playoffs, he scored the third goal against Chippewa Falls to end any hope of a comeback in the sectional semifinals and had four assists against RAM a round earlier. Koller, Urdahl and Stange started the season together for a game or two but were split apart when it seemed they weren’t on the right page yet. After a few good practices together midway through the year, they were reunited, and there’s been no reason to change since. The time together has a helped the trio build lethal chemistry and, like many strong units in high school hockey, there’s also years of familiarity to build on going back prior to the varsity level. Koller wears the captain “C” on his chest, just like his other two linemates. It’s a testament to the maturity he’s shown throughout the season, understanding what is expected of him. Not every high schooler can check their ego at the door. With the season North has had, it’s also hard to complain when the talent around you makes the game a little easier. Tuesday’s practice at Hobbs was the Huskies’ final tuneup in Eau Claire before heading down to Madison for Thursday’s 12:30 meeting with fourth-seeded Verona. Their journey kicks off today at 9 a.m. when the bus leaves the high school as part of a send-off ceremony. Once in the capital, North will practice at Alliant Energy Center at 2 p.m. today.